A federal trial court in California blocked new Trump administration conscience protections regarding abortion in a rare Sunday decision, reigniting the latest legal battle over Obamacare. In 2011, Secretary Kathleen Sebelius of the U.S. Department of Health and Human Services (HHS) created a regulation declaring that “preventive care” includes contraceptives. Some of these contraceptives are abortifacients, meaning drugs that can cause abortions for women who have recently become pregnant. President Barack Obama refused to allow a religious exemption to this regulation, overruling objections from some members of his own administration, including even White House Chief of Staff Bill Daley, who resigned shortly thereafter. Instead of an exemption, HHS created an “accommodation” in 2013 for religious nonprofit organizations. Under this “accommodation,” a religious organization that certifies it satisfies the eligibility criteria is not required to pay for the contraceptives, but instead shifts that cost and responsibility to the nonprofit’s insurance company. In 2014, the U.S. Supreme Court in Burwell v. Hobby Lobby Stores held 5-4 that Obamacare’s “contraceptive mandate” violated the Religious Freedom Restoration Act (RFRA) for private businesses owned by people who oppose abortion for religious reasons. The Court thus sided with the Green family, who are pro-life Evangelical Christians. The narrowness of Zubik is likely due to the sudden passing of Justice Antonin Scalia in February 2016, without whom the Court could not garner a majority of five justices for a broader decision like Hobby Lobby. After President Donald Trump took office, he signed Executive Order 13798 in May 2017, the first executive order ever issued to defend religious liberty. 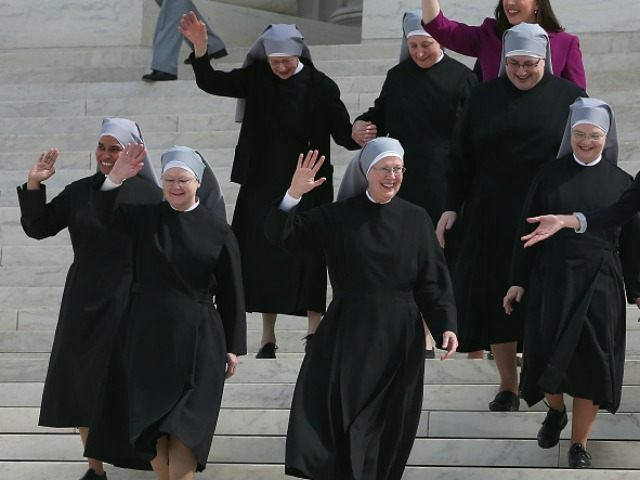 In one section of that order, the president directed HHS to develop rules for rights of conscience regarding abortion broad enough to fully protect organizations like the Little Sisters. HHS implemented Executive Order 13798 by making the accommodation’s self-certification requirement optional, so that religious organizations need not take any actions they believe immoral. These new rules were later revised when Judge Haywood Gilliam of the Northern District ruled against the first version. On Sunday, he ruled against the revised regulations as well, one day before the protections were scheduled to take effect. Gilliam held that requiring faith-based organizations to do the certification does not violate RFRA because he decided the original accommodation is not a substantive burden on anyone’s religious faith. He added in his 45-page decision, “at some point, accommodation may devolve into an unlawful fostering of religion,” lifting that phrase from a 1987 Supreme Court case that seems irrelevant to the facts of this case. For these and other reasons, the judge held that California and the other liberal-led states challenging the new religious liberty protections were likely to prevail in the lawsuit, and thus entitled to a preliminary injunction blocking the new protections. Rather than continue the litigation to final judgement in the district court, the U.S. Department of Justice will now appeal the preliminary injunction against HHS to the U.S. Court of Appeals for the Ninth Circuit. The case is California v. Health and Human Services, No. 17-cv-5783 in the U.S. District Court for the Northern District of California.